Many Alaska Cruises start or either finish at San Francisco and adding extra night in this amazing town is really easy. One of America's most attractive cities, San Francisco is a friendly and charming city always welcoming to visitors. You'll find plenty of perfect snapshots in the "City by the Bay," with its hilly streets, famous bridges and historic cable cars. Not to mention the notorious former offshore prison Island – Alcatraz! Fisherman's Wharf - Once home to San Francisco's fishing fleet, today it features seafood vendors, souvenir shops and tourist attractions, such as the Wax Museum, vintage sea craft from World War II, and a historic maritime park. Plus don’t miss Ghirardelli Square for you chocoholics out there! 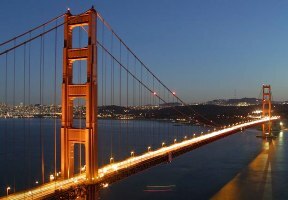 Don't miss the Icon that is Golden Gate Bridge - The graceful Golden Gate Bridge is a national landmark and famous icon. Why not hire a bike from ‘blazing saddles’ and cycle across to Sausalito (you might want to give your legs a break and catch the ferry back!) San Francisco's cable cars are a fun way to travel and another icon not to be missed. They offer the perfect way to view the city from Union Square to Nob Hill and Chinatown, to Fisherman's Wharf.